The Alaska Association of Paralegals is a non-profit organization comprised of individual members in several cities in Alaska. We hope you find the information you are looking for and will consider joining us. The Alaska Chapter of the Federal Bar Association (FBA), in cooperation with the Alaska Association of Criminal Defense Lawyers (AKACDL), invites you to attend a presentation on Mental Illness and the Criminal Justice System on Wednesday, March 6, 2019 from 5:00-7:00 p.m. at the 49th State Brewing Company in Anchorage. Our presenter is Bowman Smelko, Psy.D., ABPP, a board-certified forensic psychologist. Dr. Smelko will discuss symptoms and the diagnosis of mental illness in the criminal justice system. When: Wednesday, March 6, 2019, 5:00 p.m. until 7:00 p.m. Cost: Free for FBA and AKACDL members. Non-members will be charged $15.00. Refreshments and drinks will be provided. No pre-registration is required. Are you seeking a paralegal related certificate or degree? Check out this scholarship opportunity by Buckfire & Buckfire, PC. The American Bar Association is doing their due diligence to survey paralegal associations regarding how members of our profession are referred to or titled, i.e. paralegal, legal assistant, etc. You may recall that in their response to NFPA’s Marketing the Paralegal Profession Committee’s letter, they indicated that they would be surveying associations to determine whether they should remove the term “legal assistant” from their definition of a paralegal as we requested. It’s a short survey, and if you would take the few minutes to respond, it would be much appreciated! We want as many NFPA members to respond to this as possible so that our collective voice is heard! We have several volunteer opportunities available. If you have questions or are interested in volunteering, please contact a Board member. 1) AAP Board Member - The Board meets once a month to make important decisions for the association. We may occasionally discuss things via email. It is a great way to get to know other paralegals in AAP and to learn what decisions are being made. 2) Program Committee Member - The program committee meets once a month to discuss our monthly CLE meetings and brainstorm upcoming topics. The members work together to coordinate a speaker for our monthly CLE luncheons. 3) CLE Committee Member - The CLE committee will be meeting soon to coordinate the upcoming Spring CLE. If you are interested in helping on the CLE committee contact one of the Board members and we will get in touch with the CLE chairperson. 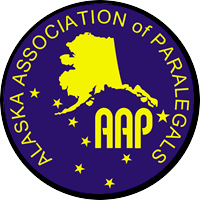 Join AAP today and become a member of the only paralegal association in Alaska. Do you have a product or service to provide in the legal community? Consider sponsorship today! Click here to see the benefits of sponsoring AAP. List your open positions on our job bank page. Please fill out the Job Posting Form and email it to info@alaskaparalegals.org. The web manager will post the job opening within three days of the date of receipt to our "members only" job bank page. The job openings will be posted for 30 days or until the position is filled. If the position is filled before the 30 day period is over please contact us at the email listed above to give us an update. The job posting will then be removed.